The Pizza King restaurant closed here in September 2015. Another pizza place opened for a while but didn’t last. 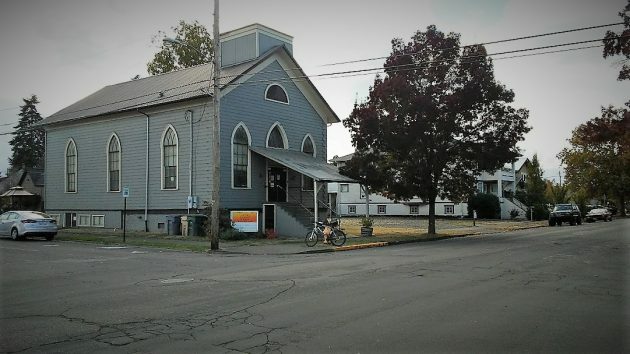 CHANCE, a faith-based entity striving to help people in recovery from drug use, has plans to move into what used to be a popular Italian restaurant in Albany’s downtown. The organization has applied to the city’s planning division for a “change of use” and site plan review at 231 Lyon St. S.E., at the corner of Third Avenue. The city last week published a notice inviting written public comments by Oct. 12. I haven’t heard back from CHANCE but understand the organization is negotiating with the property’s Portland owners to buy the building, which for many years housed the Pizza King. That restaurant closed in September 2015. Another business, All Star Pizza, then opened there but now has been closed for a while. CHANCE operates to help recovering drug users. It offers support groups and helps with job placements, housing assistance, and so forth. In videos on is website, formerly homeless clients recount by means of written flash cards how their lives have turned around because of the group’s help. The city’s notice says the change of use for which a permit is being sought is from a restaurant to “community service.” Presumably that includes CHANCE’s various counseling and related activities, and making pizza is not part of the mix. This is the current CHANCE location at 238 Third Ave. S.E. The pizza at the old Pizza King was never that good to begin with. Now that CHANCE is taking over, the building will finally be put to good use, helping drug-addicted persons with a sound and reasonable way up and out of their problems. If only we could get the Linn County DA’s office to view the problem of drug addiction as a medical/societal problem rather than as a moral failure or a character flaw. It is almost like the DA, particularly Asst. DA, Wynhausen, have swallowed the Right Wing Kool-Aid. Their view is that only Jail Time will help. Our hats are off to CHANCE as their solution actually addresses the problem realistically, whereas the Linn Co. DA seems to believe only a stiff jail sentence, a VERY costly jail sentence for Linn Co. taxpayers, will do. So let me see if I understand this…. You want to put a drug treatment facility across the street from the Albany Visitors Center? That’s going to be an interesting discussion. Half the City Council wants to run every drug addict out of town and the other half will defend the work done by CARA with every political bone in their body. Not sure who you’re going to get to support this project. Drug addicts and thriving URD’s are not mutually compatible. So, if you’re a struggling human being with a serious drug addiction problem you dare not be caught haunting the Downtown core. However, if you are a struggling White businessperson, armed with a plan requiring taxpayer support, then CARA might just come to your rescue and NOT exclude you from downtown. Your past problems are not germane to the issue. Going forward, if you continue to blithely not follow very-basic rules, you may be tagged to appear before the judge who will then give you options and choices. If you do avail yourself to them (and there are many), life is good. If you do not, that’s strike one. If you do it a 2nd time, see #1 – that becomes strike 2. If you persist in the behavior and are unwilling to make sound choices, you possibly will be excluded — that’s up to the judge. It’s called gentrification, or, the process of ‘renewing’ an area so that it conforms to the tastes of the Albany City Mayor, a majority of the city council. the CARA advisers the council appoints, and the Mayor’s Landmarks Advisory Commission. The sign has been out for many years now: Those who disagree “hate” Albany and are unwelcome deplorables. Watch out JJ, you too may be added to the list. If it would help, I’d put a drug treatment center across the street from the carousel. It seems the premise by certain posters is that simply being a human being automatically grants you access to all aspects of the community regardless of behaviour. We as individuals choose to live together as a group in a common geographic area and have decided that certain behaviours should be discouraged or cause that person to not be allowed to partake in certain community activities. Yes, the community has chosen to repair the downtown area and create value. This does create an economic scarcity issue, those with more economic resources now wish to use this gentrified resource and those without the same economic resources are excluded to some extent. I.E. Prices in the restaurants that have moved in. I’m not understanding the reasoning behind putting “White” in front of “businessperson”, perhaps you can explain your reasoning in the context of this conversation, how does it further your argument? We have chosen to encourage the businessperson and the type of behaviour they exhibit. We have found that those that engage in commerce activities tend to create goods and services, creation of wealth for the community, all of which furthers the strengthening of the community. Drug addiction on the other hand has been found to be destructive both mentally and physically to human beings, it has a negative impact on the community as a whole, this is why we discourage this type of behaviour. Some like Ray, choose to try and provide a path for treatment in order to eliminate the destructive behaviour, but without speaking for him, he seems to have toleration limits, his toleration limits appear to be greater than others on CC but they are limited. Others choose to take a hard-line approach if you’re going to engage in behaviour that is destructive to the community, “we just don’t want you around”. Case in point the parents that showed up in support of the Exclusion Zone; the elimination of the negative effects on their children by those addicted to drugs, is far more important to them than trying to treat the drug addiction. Not getting the preoccupation with the siting of the facility “across from the Visitors Center.” Is the Visitors Center akin to the Sistine Chapel?? As the writer Jay clearly states, “We as individuals have decided that certain behaviours should be discouraged or cause that person to not be allowed to partake in certain community activities. Back in the 1600’s in New England, “individuals decided that certain behaviours should be discouraged…” To solve the problem, they ended up burning a couple-hundred mostly women as Witches. But hey, call me a pessimist. Jay forgets that to a homeless person, his hallowed ‘certain community activities,’ like eating, sleeping, excretory matters, legal issues, healthcare challenges and the rest of what goes on in daily life, depend in large upon being able to access human services…nearly all of which are provided in the Inner Sanctum of Downtown. I guess we could ask the State Dept. of Human Resources, the Department of Motor Vehicles, the Linn County Health and Mental Health departments, the City and County Jails and the many other organizations to move their operations out beyond the CARA/Downtown sensitivities. That way, the tens-of-hundreds-of-thousands of visitors beating down Albany’s door will not be stifled by the buzz-killing ugliness of homeless families on the Streets of Our Fair City. I don’t know that anybody is insisting that CHANCE be front and center, downtown, across the street from the Visitors Center, on the main street in and out of town. 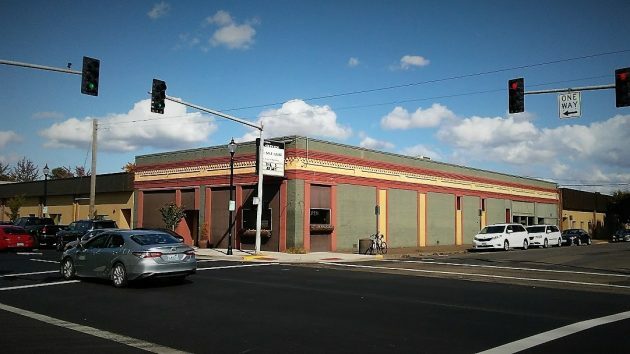 I think that there was an available, empty building for sale/lease and CHANCE took had the opportunity to buy it for an agreeable price and move into a bigger space. If you think something else should be in such a visible place, then outbid the buyer and put it in. That’s how the market works, and nobody is putting a thumb in the eye of the community or trying to put people on display. Well said. So many negatizers missed the point. CHANCE has outgrown a facility near downtown. The clients are used to the area. There’s a vacant building relatively near the existing site that could serve the need. No conspiracy, simply supply and demand at work. I commend you on your argument J.J, we shall see what the citizens of Albany decide.